Here, we consider the nonlinear compression of pulses. First, the pulses are spectrally broadened by the nonlinearity of a fiber; at the same time, the pulse duration increases somewhat due to chromatic dispersion. After the fiber, a dispersive compressor is used for obtaining near bandwidth-limited pulses with accordingly shorter duration. The dispersive compressor is numerically optimized for maximum peak power of the pulses. The diagram below also shows the amount of group delay dispersion (GDD) used for the compressor. 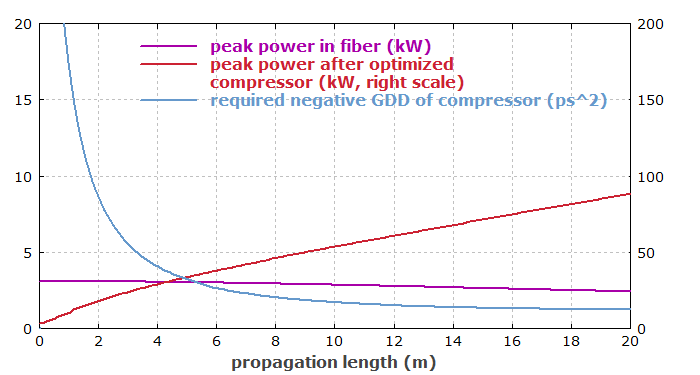 Interestingly, for a longer fiber piece one requires less GDD. This is due to the increased pulse bandwidth.